Dinornis (Gr. terrible, and bird), a gigantic extinct bird, whose bones have been found in New Zealand. The history of this genus, established by Owen, is one of the most remarkable examples of the correctness of the great laws of the correlation of parts so beautifully elaborated by Cuvier. In vol. iii. of the "Transactions of the Zoological Society of London " is the first paper by Owen on this subject. 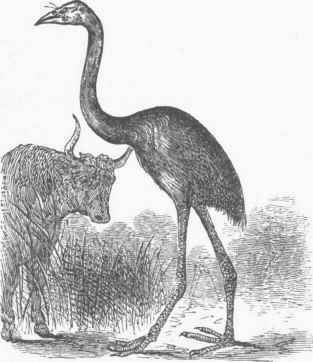 He had received from New Zealand a fragment of a femur, six inches long, with both the extremities broken; from its texture and size he concluded that it belonged to a bird of the struthious order, but heavier and more sluggish than the ostrich; the bone was not mineralized, and retained much of its animal matter, though it had evidently remained in the ground for some time; this was in 1839. In a second memoir, communicated in 1843, he gives descriptions of portions of the skeletons of six species of a struthious bird, named by him dinornis, which appeared to have become extinct within the historical period in the North island of New Zealand, as the dodo had in Mauritius. These specimens, 47 in number, had been sent to Dr. Buckland by the Rev. Mr. Williams, a missionary, who wrote that they were taken from the banks and bed of fresh-water rivers, buried only slightly in the mud, and probably quite recently; that the birds formerly existed in considerable numbers, and must have attained during a very long life a height of 14 or 16 ft. The bird to which these bones belonged was called moa by the natives. The names given by Owen were dinornis giganteus, height at least 10 ft.; D. ingens, 9 ft.; D. struthioides, 7 ft.; D. dromi-oides, 5 ft.; D. didiformis, 4 ft.; and D. otidi-formis, of the size of the great bustard. From these specimens he inferred that the wings were quite rudimentary; that the large cervical vertebrae supported a powerful beak; and that its strong legs were used in scratching up the soil to obtain the nutritious roots of the ferns which are so characteristic of those islands. He draws a portrait of this gigantic bird, the highest living form in that part of the globe, with no terrestrial mammal to contest its possession of the soil before the arrival of the first Polynesian colony. In a third memoir, read in 1846, an examination of a larger number of specimens confirmed the deduction as to the rudimentary condition of the wings by the discovery of a keelless sternum; showed that the species of this essentially terrestrial genus were heavier and more bulky in proportion to their height, more powerful scratchers, and less swift of foot than the ostrich, but in different degrees according to the species; and indicated an affinity to the dodo in the shape of the skull, with a lower cerebral development, and consequently greater stupidity. He formed a new genus, palapteryx, of the species ingens and dromioi-des, characterized by a posterior or fourth toe, the three of the dinornis all being anterior toes; he added the three new species, D. crassus, D. casuarinus, and D. curtus, all of small size. In a fourth paper, read in 1848, he establishes a new genus, aptornis, in which he places what he formerly called D. olidiformis; this has a large surface for the hind toe, a strong perforated calcaneal process, and a more posterior position of the condyle for the inner toe; it resembles the apteryx in the comparative shortness of the metatarsus. In this he describes perfect skulls and beaks of these birds, from which he concludes that the dinornis, though resembling the struthionidoe in the extraordinary development of the legs and the rudimentary condition of the wings, does not come very close to any existing struthious birds in its adze-like beak, crocodilian cranium, form of the pelvis, and proportions of the metatarsus. The genus palapteryx belongs to the struthionidoe, being in some respects intermediate between apteryx and dromaius. The law of the localization of animals, so remarkably illustrated in the recent progress of geology, receives an additional confirmation by this occurrence in the river banks of New Zealand of remains of gigantic birds allied to the small species (the apteryx) still existing only in the same islands. In vol. iv. of the "Transactions," in 1850, the feet and sternum are described, and two new species are alluded to, D, rheides and P. robus-tus; further descriptions of the skull, beak, and legs are given in the same volume. Some years before the discovery of these bones in New Zealand, attention had been drawn to remarkable impressions in the new red sandstone of the Connecticut river valley, in Massachusetts, which were believed to be footprints of birds, the largest of which must have exceeded the ostrich in size. Geologists were unwilling to admit the existence of birds at this remote epoch, or of such large ones at any time; but the subsequent discovery of D. giganteus demonstrated the existence of birds, at a comparatively recent period, whose tracks would have been 22 in. long and 6 wide, considerably larger than those of the Connecticut valley. The occurrence of these gigantic birds in New Zealand adds much to the evidence that similar apterous and low-organized reptilian birds existed in America during the red sandstone epoch, "the age of reptiles," when the coldblooded and slow-breathing otipara exhibited such various forms and so great a number of species. Though many of these bones are apparently recent, and though it is not impossible, in the opinion of some, that the dinornis, like the apteryx, may still exist in the interior of these islands, they belong to a certain extent to the class of extinct genera. In a more recent paper in the "Proceedings of the Zoological Society," for April 8, 1856, Prof. Owen describes the D. elephantopus, the most extraordinary of all for the massive strength of the limbs and the general proportions of the breadth and bulk to the height; and it is the opinion of Mantell that this species existed in the Middle island with the first Maori natives. From a consideration of these species, it appears that those of the North island were distinct from those of the South.